I was looking at the charter for the A. Douglas Smith Jr. Lodge of Research recently and noticed that the name is apparently – according to the charter provided by the Grand Lodge – A. Douglas Smith Jr. Lodge of Research Lodge. Funny. As you can see, it is just an accident of a good name not fitting the prescribed format of the charter, and nobody has ever tacked on the final word Lodge onto the name, as far as I have ever seen. There are all sorts of things waiting to be discovered in Masonry, from the esoteric to the downright amusing. There’s something I learned of recently called an academic lodge. No, not a research lodge, which is typically a lodge under special dispensation for the purpose of conducting Masonic research. A research lodge usually cannot work in the degrees and thus has a special mission. An academic lodge, as I understand it, is a regular lodge in all ways that is set up in an academic community specifically for that community. Harvard has one and now George Mason University may be getting one on campus. These lodges are set up so that only members of the university community – that is, professors, students, alumni, etc. – can join. My understanding is that the university staff, such as janitors, cannot even join. First of all, let’s get out of our minds the idea that because Harvard does something that it’s necessarily good or intelligent. Having worked in the education world and many other places, I can tell you that a fancy-looking degree is just that: fancy-looking. What a person knows and can do is much more important than where he or she went to school. What makes Freemasonry special and beautiful is that it unites and equalizes different groups of men from all walks of life. In my own lodge we have generals, admirals, presidents of banks and corporate leaders. We also have plumbers, police officers, HVAC mechanics, waiters and even lowly photographers and writers – the lowest of the low – like me. We can all shed those outer selves and sit together in unity, all members of the same organization, meeting on the level. Academic lodges are reserved for a group that seems to see itself as an elite class. Membership is restricted based on social status. This is a step backward in the progress we have made as a fraternity and society. People used to say that the lodges were havens for white men only but now more and more of our lodges are integrated, and that makes the fraternity stronger. Now are we going to say that some lodges can restrict their membership based on educational status? That’s not meeting on the level. That is the opposite of one of the things I hold most dear about Freemasonry. I asked last night at our lodge meeting about this issue and was told that I would be welcome to attend the lodge meetings but that I would not be able to join. I have to ask myself whether I would even want to visit an organization that would not have me as a member based simply on my social standing. The answer is no. I want no part of such an elitist group where only some of the brethren can meet on the level. The really positive part to all this is that it will be a great way to attract some younger Masons. For that I think the lodge will be very valuable. We aren’t just a bunch of old guys, as some may think, but I suspect the median age is still quite high. We can use some younger blood in our midst. Overall, the whole idea left a bad taste in my mouth. I suppose I can be swayed to accept it but it might take some selling. What do you think of this idea? 5 July 2013. Correction: Bro. AJ of The Patriot Lodge informs me that Masons who are members of other lodges may affiliate. Only the candidates nee be from the university community. In addition, the candidates may come from any part of the university community. This is contrary to what I had earlier been told. Thank you, Bro. AJ. I had the pleasure of traveling to New Mexico about six months ago. It’s amazing to me how time flies sometimes. It seems like I just got back but the bite in the air tells me otherwise. I got to visit a good number of lodges, although I did not get to sit in on a meeting because the days I was there simply did not overlap well. My first stop was to the Grand Lodge of New Mexico, where the Grand Secretary, M.W. Bro. Callahan, was good enough to show me around their museum and let me bend his ear for an hour or so. I have said before that I enjoy taking photos of the lodges in places I visit, so here are some cool ones from a hot state out west. The Grand Lodge building. Note that I did not get the whole building in the picture. That is because I could barely see the image in my camera’s LCD, so I took a guess at what I was getting. The sun was almost directly overhead, as you can tell by the shadows, and everything in New Mexico reflects the sun much more than I have seen elsewhere. This lodge was an outbuilding behind the Grand Lodge, like a trailer you might see on a school’s grounds. Sandia Lodge #72. The sign looked funny so I took a closer shot. It looks like scorch marks. Maybe my brother Leroy, who grew up in Albuquerque, can explain what the heck happened to that sign. We don’t have that type of thing happening back east. Another one: Temple Lodge #6 in Albuquerque. It was in a small strip of offices near the edge of town. You can tell you are near the edge of town very easily in New Mexico because the buildings stop and desert starts. Montezuma #1 is Kit Carson’s mother lodge and in the lodge’s safe is Kit Carson’s rifle. I didn’t get to see it, but I was told it was right behind that safe door. Yep. What surprised me about the lodge was the five seats in the East. In Virginia we typically have two or three but I had never seen five before. Finally, I got a tour of the Santa Fe Scottish Rite building. It was a fantastic place to behold. It was quite dark inside, though, even in the middle of the day, so I was unable to get a good shot of the interior. if you are ever in the Santa Fe area, though, I recommend stopping by to see the place. I am not in the Scottish Rite so some of the symbolism was lost on me but I did note the 29 stairs leading to the front door and a few other features. Cherrydale Lodge just had its installation of officers and I was installed as the senior warden. One more year until master, if everything goes well. I am looking forward to this year and the challenges it presents, including preparing for next year. That means getting programs together for 20 meetings for next year, fine-tuning our promotion system for attracting members of other lodges, getting a program in place for public relations, which our lodge desperately needs, and a million other things. And I thought this year would be easy. But back to the installation. It’s always a lot of fun to get the brethren together and see the officers, especially the new ones, dressed up in tuxedos and white gloves. In our society, even within Masonry, there is a movement to take the formality out of what we do and slide into a business casual way of dressing and conducting ourselves. Let me come down now and say that I prefer the more formal way of dressing, at least for Masonic activities. For one thing, we have a good number of younger members, college-age guys, who can use the practice dressing up. I know it’s not rocket science but unless you went to a military academy, formal dress was probably never emphasized in your college experience. In addition, I think the formal dress we usually have – suit and tie – adds to the solemnity and formality of the evening’s activities. We sometimes get the complaint that it’s hard for people in some lines of work to wear a suit. Personally, I don’t buy it. Our last master was a police officer and the one before him was a plumber. Both these men managed to put on a suit. Sometimes it was in their vehicles or in the lodge bathroom, but they always managed it. We had a member who died a few years ago whose life’s work had been in the world of trains. I have heard stories of him getting off work looking like he rolled in coal dust but somehow getting it together enough to look good for the meetings. Dressing up can go a bit haywire though. Alexandria-Washington Lodge #22 has its officers dress in tuxedos for each meeting because they have certain strong traditions they want to keep in place and want to attract certain types of members. I was talking to one of their officers about this one day and mentioned that I would not be attracted to that type of lodge partly because of the dress required. Of course, I may not be their target member. That’s a self-correcting issue, I suppose. At any rate, we have another year of officers installed and ready to go for our first stated communication on January 7. come on down and join us! I have yet to be able to formally visit any lodges while traveling away from home. However, I try to drive by the lodges if I have time and snap a couple photos because I think it’s interesting to see the different types of construction. Some buildings look like little more than small industrial buildings while others are large and grand, breathtaking. I was in Toronto a couple months ago and snapped these photos. 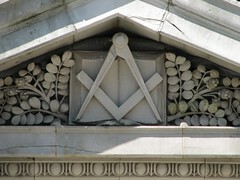 Cornerstones in a memorial garden at York Masonic Temple. These are probably from different temples whose lodges merged. And Thornhill Masonic Temple, which had graffiti on the doors but did not appear to be in a bad area. Probably just neighborhood kids. This is not Masonic, but should you be traveling through Toronto and want what I consider to be the best authentic Chinese food ever, try out Buddha’s Vegetarian Restaurant on Dundas, between Bathurst and Spadina. Yum!